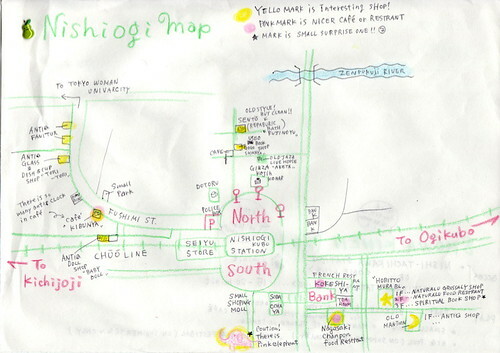 After a discussion about favorite places in Tokyo, one of my students told me about her favorite neighborhood, Nishi Ogikubo. The student, Kyoko, is a super sweet, hardworking, single mother. She has a great funky style. Like once she had a handbag made of Heineken beer cans that was surprisingly chic. When she learned that I had never been to Nishi Ogikubo, or even heard of it, she excitedly told me of all the cool shops there, and charming cafes. And on the last day of class she gave me this hand-drawn map, with recommended places to visit. That was about 5 months ago and I’ve been itching to go there since. Yesterday I had a free morning and hopped on the Chuo Line to pay a visit. At first glance it seemed like any other newly renovated local station area: chain restaurants, discount bag stores, pachinko parlors. The map appeared to be separated into 3 main areas. I went to the smallest one first where there was a natural food store, an organic restaurant, and a new age bookstore. Unfortunately, only the food store was open. So next I went along Fushimi St. By then it was 11am but most of the stores were closed. I noticed that many of the stores were closed on Wednesdays. This is similar to many restaurants in the U.S. that are closed on Mondays. Although in Japan, a neighborhood can decide that day off to be Tuesday, Wednesday, or even Thursday. Nevertheless, along the side streets there were numerous cafes, most closed. But I got lots of great shots of interesting doors. 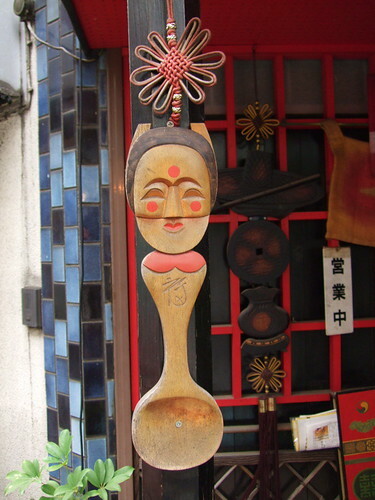 Nishi Ogikubo definitely has the best collection of intriguing cafes in Tokyo. Among the few cafes that were open I ventured into Shallow’s Café, which is just out of Kyoko’s map (go to the end of Fushimi St. and turn right). It had been open only two weeks. What drew me in were the displays of 60’s and 70’s rock album covers in the window. The café concept is to listen to an album from the owner’s collection and drink coffee or eat lunch. I requested something by Crosby, Stills, Nash and Young. And he pulled out a Stephen Stills solo album that I’d never heard. Awesome! I enjoyed the clean, wood look of the interior, littered with bits of Americana. 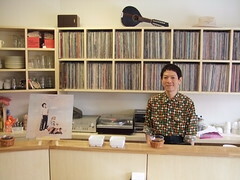 The owner, who spoke very good English, explained that he wanted to share his collection of music. When I asked him about the name of the café, he explained that his Japanese surname translates to “the shallows of a body of water”. Also in the neighborhood were many antique shops. North of the station there was a cute street with a great bookstore with lots of children’s books, and folk crafts stores. I found a lot of import goods and furniture that were a fraction of the price in more trendy neighborhoods. I’m definitely going back. But not on a Wednesday. Although, I like the mystery of a neighborhood filled with colorful unentered doors. Click on any of the pictures to see more from the neighborhood.